I get it: email, Facebook messages, text messages, tweets — they're incredibly convenient. NEWSFLASH: They lack personal touch. I'm in fundraising. My world thrives at the intersection of solid marketing, strategic planning, and relationship building. The most powerful tool in my bag is not the relationship—important as it is, that develops over time. It's not technology—sure, I can reach people quickly, but anyone can send anyone an email. In fact, of all the tools a fundraiser has the most powerful is time. Handwritten notes stand out in the world that thrives on quick digital communication. Whereas we used to send notes because people expected us to, we've traded personal touch for expediency. Sending handwritten notes communicates a level of care we rarely see. It says that someone took the time to handwrite a note focused on an individual. Surprise! It doesn't matter what you say if people can't write it. Fewer people can write cursive than even 10 years ago, and even fewer can read it. In fact, I had a perfectly legible letter returned to me because it was labeled "Illegible." Someone couldn't read it because, well, they didn't know how to read cursive. When in doubt, print your note. Make sure your message is clear and understood. Don't write a rambling note that has no point. While it's great to write a letter, if it doesn't have a point you will lose an opportunity to grow trust. If you met someone, make point to reference the meeting and describe what you would like to see in the future. If someone made a donation, say thank you and describe what it will support. Handwritten letters are great opportunities to show that you remember the small facts about someone's life. Maybe you compliment them on their child's success, or even the random comment about their childhood. How you write a note reflects how well you remember the meeting. Handwritten letters possess power because every person's writing is unique, and imperfect. 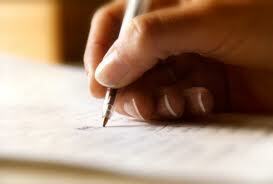 When you handwrite a letter it shows you've written a letter without scribbling out words, or using white out. Your handwriting isn't always going to be perfect, but that's fine—it's you. We show ourselves in a world that is sanitized with perfect font and spellcheck. Too many people write stuffy letters. They become formulaic, and appear as though you're writing from a form. Don't do that. Smile when you write it. You want people to feel as though you care, but also that you can smile. They'll smile when they read it. If you send a note to someone you've never met, when they meet you they'll be smiling because you made them smile before they saw your face. There are many more, but part of the beauty of writing handwritten notes is finding our own way. It requires time and attention. In our fast-food society it's easy consume and produce without any thought of the person on the other end. Make a habit of writing notes—start out small. I write 7-10 letters per day. Yes—I make time for it, and the rewards pour in. I had a guy that had never supported my institution, and he graduated over 40 years ago. I sent him a handwritten letter, and told him that I wanted to learn more about his story. I told him we cared even though he had not given us a cent. Two weeks after the letter arrived he called. He told me that the previous night he read my letter, again, in his bed (awkward) and that he felt guilty, and wanted to talk. So, take the time, spend the postage, and start making personal connections. See what happens. After all, what if someone sent you a handwritten note—wouldn't you think that person cared about you? Zac has worked in both higher education and political fundraising. He holds a Masters degree from Wake Forest University and a Bachelor's from Georgetown College (KY). He'd tell you more, but he has letters to write.